Mobile Web Apps for Smart People! My latest book (and my first book since 2001) is almost finished! 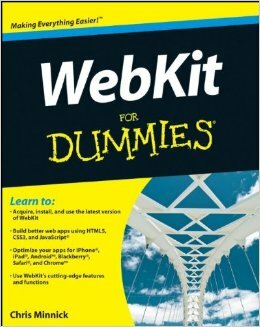 The title is WebKit for Dummies, and it’s available for pre-order now ! I’m excited about the publication of this book (coming in February), and about the topic, but I’m finding myself having to explain what exactly it’s about pretty frequently, so I thought I’d write something about that here in order to clear up some misconceptions and possible confusion. WebKit is the name of the open source browser engine that powers every mobile device’s browser except for Windows devices. This includes iPhone, iPad, Android, Blackberry, Nokia, and more. It also runs a large and growing percentage of desktop web browsers (Google Chrome, Apple Safari). My book isn’t really about WebKit, however — it’s really about how you can take advantage of the fact that WebKit is so widely available on smartphones and tablets in order to create cross-platform mobile apps with HTML5. Also, the book isn’t really just for dummies. It is part of Wiley’s huge and successful “For Dummies” series, of course, but I want smart people to buy it as well. That’s not to say that dummies won’t also learn something, but I don’t think anyone needs to be excluded — with the possible exception of people who can’t read. Now that you know all that, I hope you buy and enjoy the book!